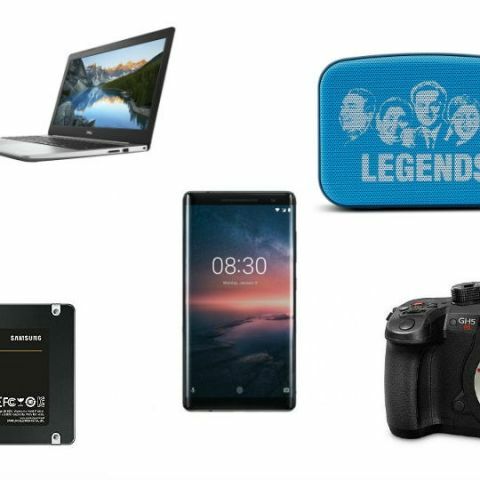 Day 2 of Amazon Prime Day Sale has offers on flagship phones, SSDs, laptops, cameras and more. Check out the best deals here. It's day 2 of Amazon Prime Day Sale and you have till today midnight to cash in on the deals and offers on Amazon India. While most of the deals we covered on Monday continue to be live, we have scoured through the catalogue once again to find more enticing deals. There are flagship phones on discount, PC components, laptops and speakers are also on offer. Take your pick and if you find more good deals, do let us know on social media. The P20 Lite feels like the younger sibling to the P20 Pro in every sense. They have similar designs and cameras that are class-leading in their own segment. Save for the battery life and the performance, the Huawei P20 Lite can be hailed as one of the better mid-range phones around. The Samsung 860 EVO 250GB comes with a five-year warranty and offers good performance. The improved MJX controller and the use of LPDDR4 ensures that your power consumption values are much lower. when using the SSD. The 2.5-inch SSD has sequential read/write speeds of 550 and 520 MB/s respectively. The Dell Inspiron 15 5575 is an AMD Ryzen-powered laptop that comes with 8GB of RAM and 1TB of HDD storage. It has a Ryzen 5 processor underneath that is equivalent to Intel's Core i5. The build is hard plastic and has a 15.6-inch HD display with integrated AMD graphics. You also get Windows 10 Home with MS Office installed. The Nokia 8 Sirocco is a beautifully crafted phone. It has a 5.5-inch 2K display that stretches all the way to the edges along the sides like the Galaxy S9 and has a flat pebble shaped design. It has a titanium-backed construction and sports dual cameras at the back that are quite adept at taking rich, vibrant photos. It is Android One certified and runs on stock Android Oreo. The only drawback is that it comes powered by an older Snapdragon 835 processor. The wireless portable speaker from Bose weighs around 0.67kg and has a range of about 30 feet. The single-piece aluminium design makes it look quite premium. Needless to say, being a Bose speaker, it packs quite a lot of sound inside a small casing. The Carvaan has swiftly become a popular gifting options to the elderlies who have lived through the 70s and 80s. The Caravaan Mini is a smaller version of the original jukebox and packs 251 pre-loaded evergreen Hindi songs from legends like Kishore Kumar, Lata Mangeshkar, R.D Burman and many more. It has USB and Bluetooth that allows it to be connected to a bigger speaker and it itself comes with mono speaker with 5 hours of battery. The Panasonic GH5s is a mirrorless camera armed to the teeth with features that would make any film-maker giggle with excitement. It does Cinema 4K video at numerous bitrates for the highest quality possible, along with offering the ability to shoot HDR video in Hybrid Log Gamma. The low light ISO performance is unbelievably good when you consider the size of the sensor, all thanks to the dual Native ISO the sensor offers. In terms of output, the camera does not falter on any account, but the lack of in-body image stabilisation does limit the audience of this camera to professionals who own gimbals and other stabilising rigs. The Panasonic Shinobi touts a 32-inch IPS LCD panel with 35W audio output from the built-in 2.1 woofer. You get one USB 2.0 port and 2 HDMI ports and 1-year warranty. which pc components to buy?